In our new “Throwback Thursday” series, our writers will go back in time to their earliest days to discuss some of their first car hobby pictures and stories. As Editor, we’ll kick it off (and do most of the posts, since we’re the oldest person here). Most driving enthusiasts have a “first brand new car” story they like to tell. Here’s one of mine, where I was saved from a terrible fate thanks to a last-minute – and almost miraculous – intervention by Car and Driver magazine. In 1978, I went to a local Ford dealer to test drive a brand new Mustang. The salesman eagerly trotted me out to the side lot where a 1978 Mustang King Cobra sat, complete with 4.9 liter V-8 and 4-speed manual transmission. The King Cobra was a variation on the original Lotus Grand Prix-style black and gold car. Several manufacturers copied that basic color scheme (including Ford, with their German Capri import), then went further by using different colors (some readers will remember the handsome brown-and-gold Trans Am, in addition to the more familiar black-and-gold. There was also an atrocious gold and black!) . 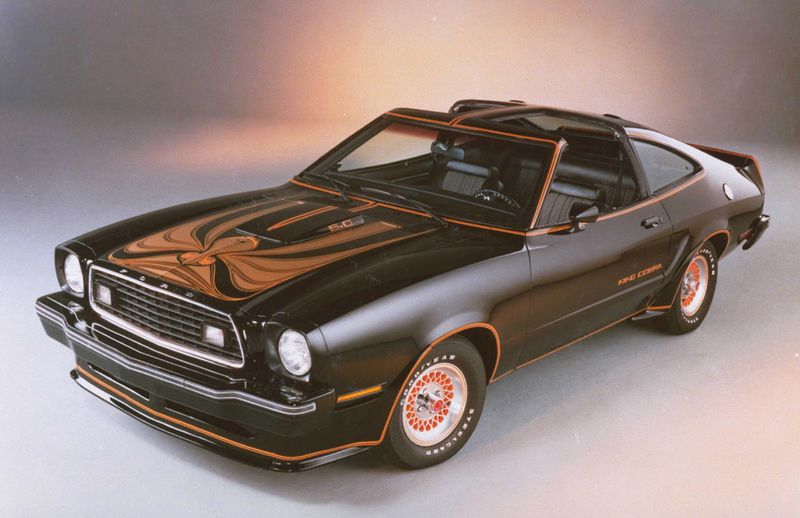 Ford tried both black-and-gold, as well as the hideous black-and-orange scheme below. This is the one I test drove. I took it around several blocks and was impressed with the suspension (by the standards of the day), compared to other Mustang II models I’d driven. However in my eyes the styling was a turnoff, especially given the giant snake on the hood. That kind of thing was popular back then with the Trans-Am crowd (which I’ll be the first to admit I might have preferred, except that it was too expensive for me to buy and insure) and Ford’s own version of the hood decal was embarrassingly more akin to a giant worm than a snake. I asked the dealer what would be involved with removing it and he said he’d get back to me. But even then it was “no-sale”…. although perhaps a “plain” V-8 Mustang might have to do. Then I drove home and picked up our mail. Terrific news: the latest issue of Car and Driver was in my mailbox and inside was a spy picture of the upcoming all-new 1979 Mustang, based on the 1978 Fairmont chassis. I’d been reading about the Fairmont the past few years as it was developed and released. It was positioned by Ford as a “European”-type car in the days before Ford shared platforms with Europe. It was a spartan car, with only a few options, but it was clearly a far better chassis for enthusiasts. And here it was, wrapped in an aerodynamic body for what Car & Driver told us was the all-new 1979 Mustang. Needless to say, I put my plans for a new car on hold. The salesman was very unhappy: undoubtedly he already knew something much better was coming and was hoping to unload the ’78 at full price. When it came to market in the fall of 1978, the new 1979 Mustang far exceeded the old one in every possible way. Lighter, faster, better design, better looking, better performance, better handling. And, better yet, this is the same time I decided to take up SCCA autocrossing. Buying the car and making that move set my course in the hobby for the next thirty years. Nothing has been the same since. 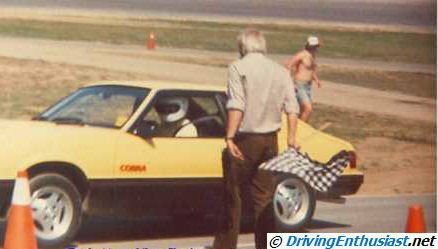 Looking back from a 2013 perspective at the ’78 Cobra, and especially at the far more competent ’79 Cobra that came to market a few months later, I’m certainly glad that fate (and Car and Driver) intervened and that I was saved from a horrible mistake with the ’78. Join us for Throwback Thursday, every week here on DrivingEnthusiast.net.